1. Full compatible with latest PHP version 7.2.9 and latest Joomla! There were some small warning issues if you use older version of EShop on PHP 7.2 and they were fixed in this version of EShop. So if you upgrade Joomla and PHP to latest version, you should also update EShop to the latest version to make sure that they are fully compatible and work together smoothly. 2. EShop Products Filter improvement. There is a new configure option in module to choose if you want to collapse all filter options at start or not. This will be very useful if your Products Filter module has many data as a very long list. By choosing to collapse all filter options at start, it will look much better and easier for shoppers to use. They just need to click on a filter option to see more if they want to filter by that option. 3. Add a new option for Cart Notify. - Popout: This option will popout a window to show the cart details. - Redirect: This option will redirect shoppers to the default shopping cart page after adding product to the cart. - Message: This option will display a message on top of current page to tell shoppers that the product is added to the cart successfully. 4. French language package update. A completely new French language package updated and added to the version 3.1.1. This is very useful for developers to check and find the issues in the case there is any conflict issue between EShop and other third extensions. - Fix a small layout issue at step 1 of Checkout. - Fix issue with auto update currency exchange rates. - Fix issue with Tax Rate search at the back-end side. Thanks for considering it, Giang. 2nd option is out of stock, 1st option has 1 in stock, 3rd option has 2 in stock, and each has diferent SKU, just like products on my web shop. I see that. I will try to add this into the future versions of EShop. Today, I am happy to announce the next release of EShop Shopping Cart extension, version 3.1.2 with some great improvements which will make EShop much more flexible for you to use. Many of customers asked me to implement the Dynamic Option Information feature which display option SKU, Availability and Weight of an option value when it is selected and this feature is ready now on version 3.1.2. 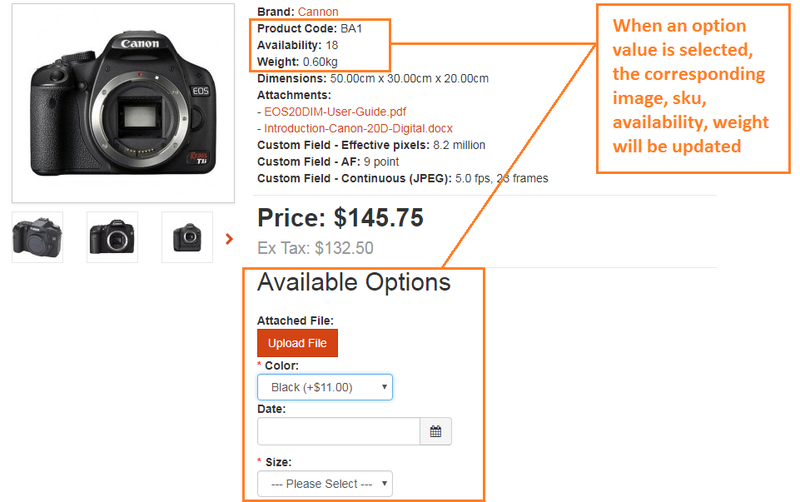 So shoppers can check the different information of an option value easily when choosing it from product details page. On previous versions, Front Page only display Featured Products. 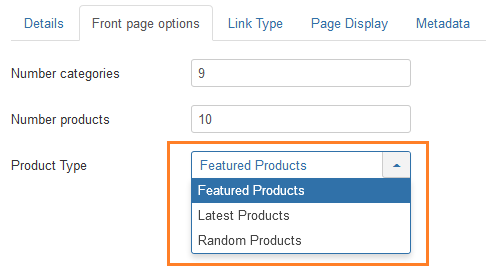 However, from version 3.1.2, you can choose to display Featured Products, Latest Products or Random Products. This give you more options to display products on the front page. So you can choose to sort them by Name, Ordering, ID or Randomly. This will be applied to all EShop pages where Category, Manufacturer, Option and Attribute are displayed. 4. Module improvement to apply new sorting configuration. - EShop Products Filter module. - EShop Advanced Search module. So the new sorting configuration for Category, Manufacturer, Option, Attribute are also applied to these modules. A very well improvement for modules. - Option to display Option Price with / without tax. - New configuration option in EShop Products module to hide out of stock products or not. - Fix a small issue with Order Status Change notification email subject. Last edit: 6 months 5 days ago by Giang Dinh Truong.